The original plan, after Redlands’ Dhat Island closed in November, the plan was to find a new place and reopen in the spring. 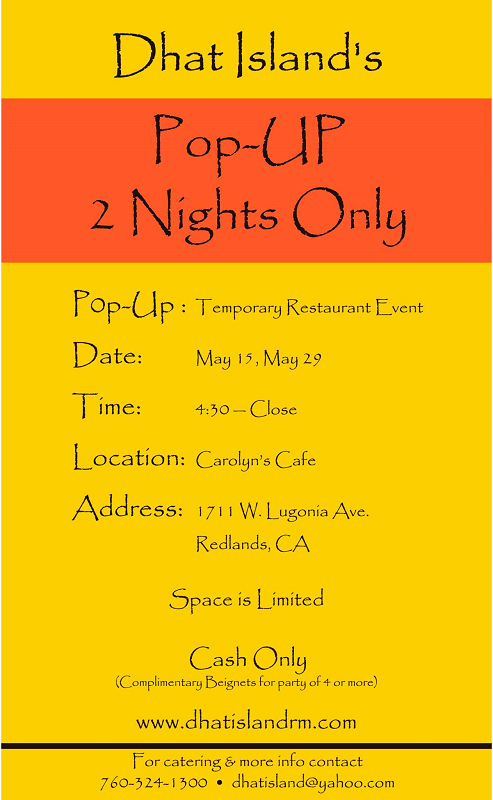 Tonight, however, fans will be able to enjoy some delicious Caribbean cuisine when the owners have a pop-up at Carolyn’s Cafe, 1711 Lugonia Ave., Suite 101, Redlands. 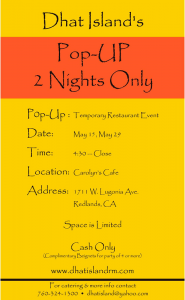 The event, which follows a similar pop-up two weeks ago, begins at 4:30 p.m.
For more information, click here and check the restaurant’s Facebook page for updates. 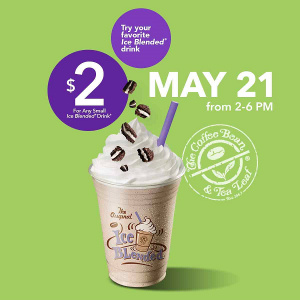 The Coffee Bean & Tea Leaf is hosting another of its occasional open houses today (May 21) from 2 to 6 p.m.
At participating locations, guests can get a small Ice Blended drink for just $2. The coffeehouse is using the event to promote customizing Ice Blended drinks with the addition of extra coffee, cookies or chocolate covered espresso beans. The chain is also offering its version of an affogato, with an espresso shot poured over an Ice Blended drink…yum! Inland Empire Coffee Bean & Tea Leaf locations can be found in Rancho Cucamonga, Claremont, Redlands, Fontana, Chino Hills, Riverside, Palm Springs, Palm Desert, La Quinta, Indio, Lake Elsinore, and Temecula. 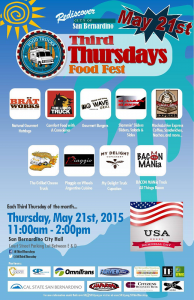 Today (May 21) is the third Thursday of the month, and you know what that means…time for the San Bernardino Third Thursdays Food Fest! The trucks are scheduled to serve from 11 a.m to 2 p.m. in the City Call parking lot on the south side of Court Street, between D and E streets. 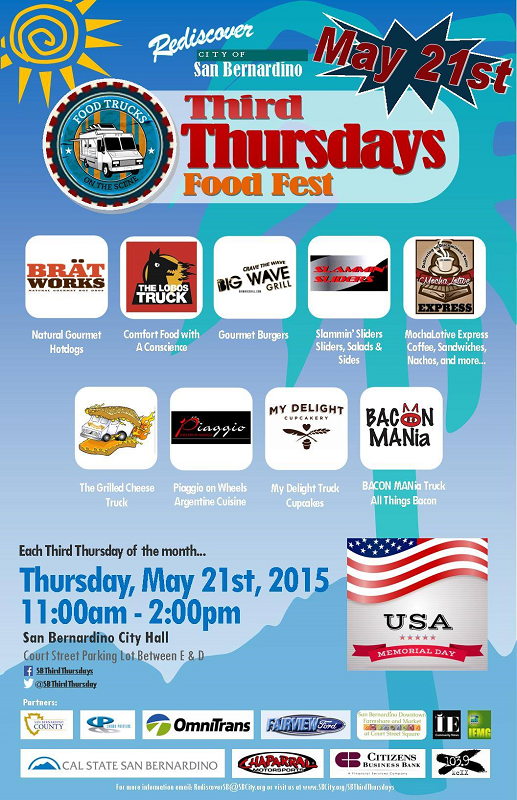 Attendees can receive a free sbX ride ticket with the purchase of a meal from participating food vendors, plus, bring your business card to drop off at the SB Third Thursdays booth for a chance to win free lunch at next month’s event. This month, nine trucks are scheduled. Head over the jump for the full list. Tomorrow (May 12) is Free Cone Day at Häagen-Dazs! Stop by any participating location between 4 and 8 p.m. and you can get a free kiddie cone, just for the asking.